June, according to the U.S. Department of the Interior, is Great Outdoors Month. If after the many cool, gloomy or rainy days we have experienced, you feel the need to expand your horizons beyond our beautiful campus, there are a number of public parks nearby. In Villanova is The Willows Park, an estate that is now a park, located at 490 Darby-Paoli Road. 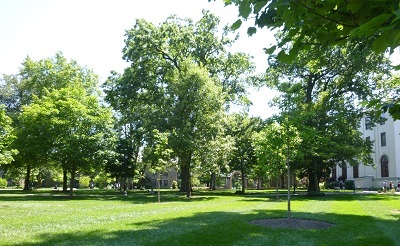 Bryn Mawr offers two parks, Ashbridge Memorial Park, 1301 Montgomery Avenue, and Ithan Valley Park, 642 S. Ithan Avenue. Moving further from campus, in Wayne are Harford Park, 260 Gulph Creek Road, and Radnor Trail, 520 Conestoga Road. Other parks in the area are Haverford Reserve Trails, Parkview Drive, Haverford, and Rolling Hill Park, 1301 Rose Glen Road, Gladwyne. And, of course, there is Valley Forge National Historical Park, a vast open space with lots of Revolutionary War content at 1400 N. Outer Line Drive, King of Prussia. Where ever you choose to enjoy the outdoors, remember to stay hydrated and wear loose clothing, a hat and sunscreen. For more tips about walking in the summer go here. Enjoy the remainder of spring!